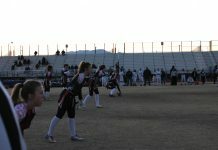 Varsity softball crushed the Silverado Skyhawks 15-0 at on Tuesday, April 2. Junior Tori Jones (#11) hit one home run and two RBI’s, junior Isabel Rodriguez (#3) scored two RBIs, sophomore Paige Sinicki (#12) earned three RBIs and senior Ashley Ward (#7) brought in another. The Cougars lost to Bishop Manogue 7-1 at home on Thursday, April 4. 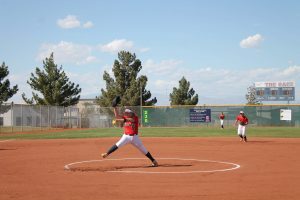 Varsity softball defeated Green Valley 13-1 away on Thursday, April 4. Both sophomore Kaila Angel (#9) and senior Aleah Baldonado (#4) scored one RBI. Rodriguez made three RBIs, and Jones had four. The Cougars next home game is against Basic High School on Friday, April 12. 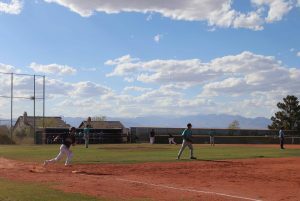 The men’s varsity baseball team smashed the Silverado Skyhawks 13-3 on Tuesday, April 2 for a non-conference game. The Cougars were scoreless the first two innings but came back scoring 12 runs in the third and fourth. Senior Jett Kenyon (#8) and junior Logan Bleazard (#12) each had two RBIs and one run. “Starting the week with a victory over Silverado pumped us up to win our upcoming games,” sophomore Reed Pippin said. The Cougars are 13-8 and play their next home game versus Basic on Friday, April 12 at 3:30 p.m. The men’s varsity volleyball team started the week off with a 25-18, 25-18 and 25-22 win over the Sierra Vista Mountain Lions at their away game on Monday, April. 1. Junior Jonathan Magallon (#3) contributed with 17 assists while sophomore Slater Fuhrman (#5) had 11 kills. Varsity defeated the Spring Valley Grizzlies 25-14, 25-15, 25-27 and 25-20 at home on Wednesday, April 3. Winiarczyk (#9) had 13 kills, and Fuhrman got eight kills and eight digs for the Cougs. 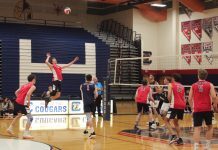 Men’s varsity volleyball defeated the Desert Oasis Diamondbacks 25-18, 25-17 and 25-21 at their away game on Friday, April 5. Senior Randy Cowles (#10) had 15 kills and six digs. The Cougs are 7-0 in league and 17-7 overall. Their next game is a home game against the Liberty Patriots on Tuesday, April 9 at 6:00 p.m.